You can’t tell from the photo (or maybe you can!) but I have a terrible head cold and drove through some damn scary torrential rains this morning to get to work. I need a nap! But look! Cardi! Pretty! Fun! And I was so excited to set up my first student today with the yarn for hers. She’s a librarian who hosts a monthly crochet group at her branch– shout out to Theresa! I also crocheted my own Blooming Sun Hat (pattern in Crochet Today) in Knit One, Crochet Too’s TyDy cotton last night (being sick is the perfect time to follow something already plotted out for me) because I wanted to try the yarn out. 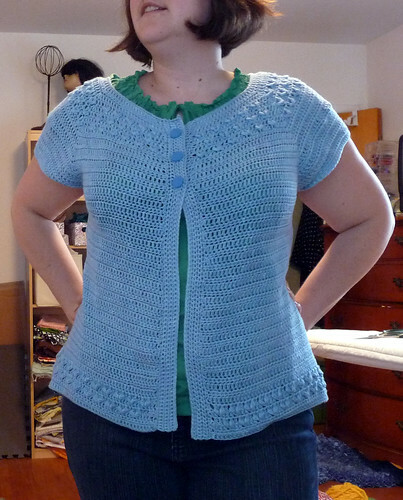 It has long color repeats which are great for crochet (hint hint to yarn manufactureres!). It came out cute… will post a pic soon. I do love that hat. Have a lovely weekend y’all. I’m totally back to saying y’all, 8 months into re-Texanizing myself. I love how you altered the front with less buttons. It is perfect, I am so going to steal that idea! "Crochet Adorned" is a constant inspiration for me, so thanks for making it. If you have a chance, you should check out the resulting fruits of inspiration from your "Tree Tote" pattern. Take the idea and run. It served two purposes-- allowing me to use only 3 buttons (I only had 4) and also, I figured I'd never be wearing it to be super warm since there were no sleeves, so no big loss there! I'm so glad you like the book- heading over to check out your blog now! Yay me! :) I wanted to start swatching as soon as we got home, but I need to finish a baby blanket first. Feels like 1000 ends to weave in! Looking great! I was psyched to get the new Crochet Today mag and see your pillow pattern in there. I'm all over it. God ain't ya clever?! Hooray crochet! I just showed my swatch of the yarn I tried for the Sunshine dress to Gwyn - he reckons 'it's too rigid'.... he's a bit right (annoying) - I'll keep on searching!